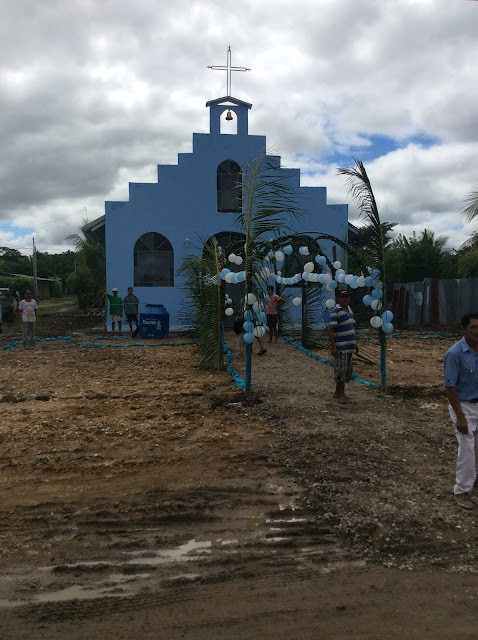 The chapel is complete in Nuevo Chimbote. What better way to celebrate than mass with our Bishop? 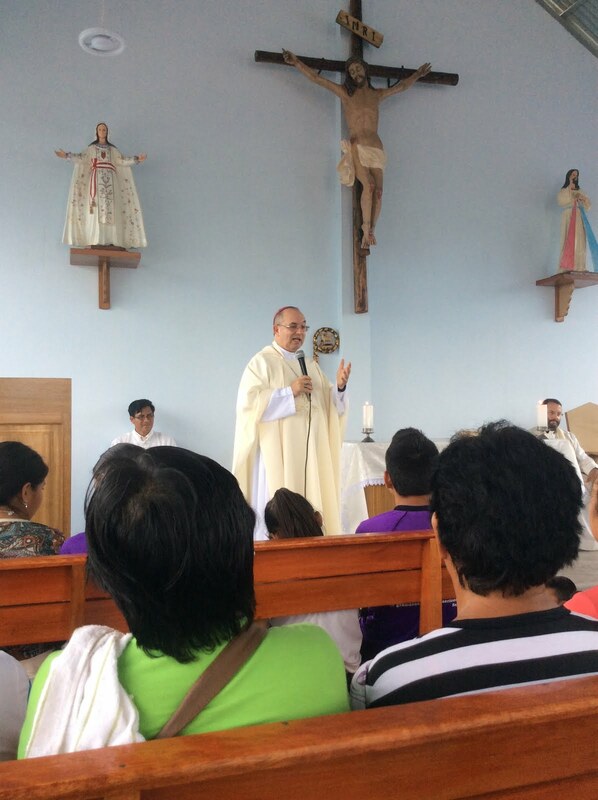 On May 25th Bishop Rafael came to the community of Nuevo Chimbote, San Martin, Peru. 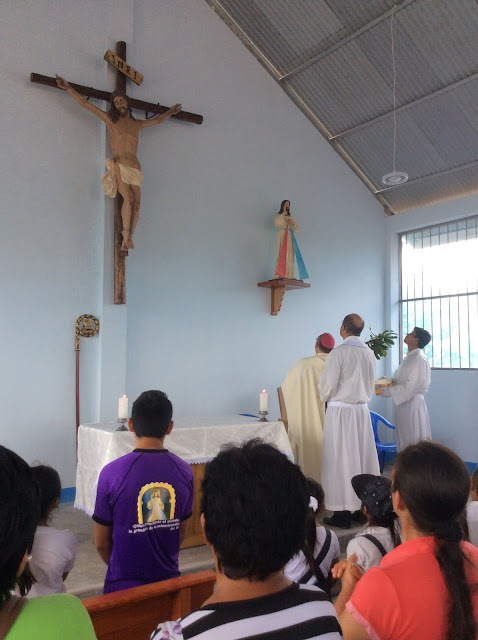 In just four months the people of Nuevo Chimbote were visited by two different bishops. For a community that had been lost this is absolutely amazing! Below are some pictures from the special day. We hope you like them. 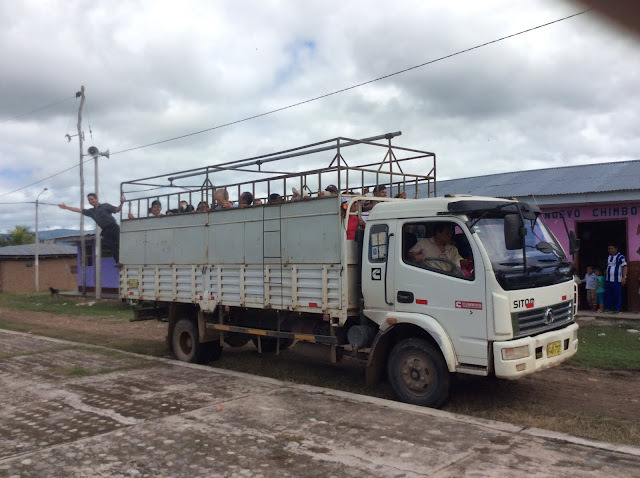 Please continue to pray for the community of Nuevo Chimbote as they are still very new to the faith. 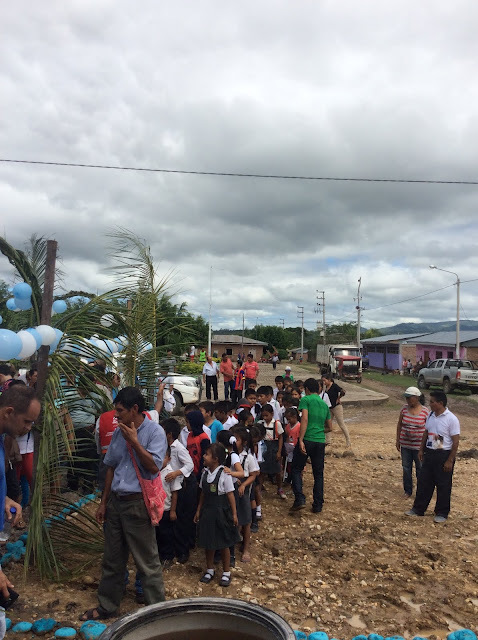 The community came together to put in this path from the road to the chapel. When they were all done laying the stones they found that the path formed the shape of a cross. Outside of the path the community will be planting flowers and bushes for a prayer garden. Above the path will be a terraces with grape vines to provide shade. Since this picture was taken the community has planted some palms and flowering bushes. They are currently working on saving the money for the fence around the chapel and the terraces. They are so excited and everyday someone is there to take care of the plants and the chapel. What a beautiful church. Here is the finished inside photo. A special thanks to our friends from Holy Family Parish who helped make this possible through their donations and their hard work here. Now wasn't digging the footing by hand worth it? The patron saint for Nuevo Chimbote is Our Lady of Mercy. How perfect that God blessed us with this community! We have a devotion to the Divine Mercy and this chapel was built in the year of Mercy. God is simply amazing! 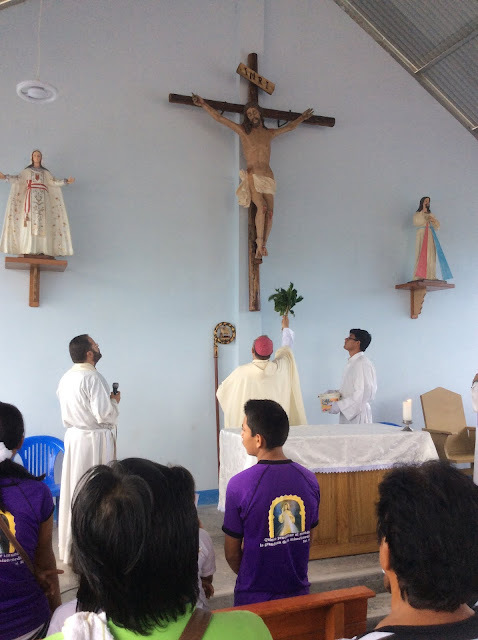 The priests brought all of the church leaders from the other communities to celebrate with Nuevo Chimbote. When I saw this truck I instantly thought cattle trailer and it brought me back to WI. 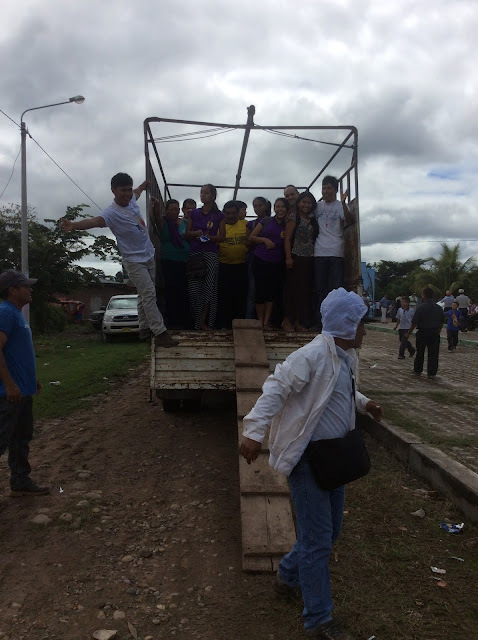 Miguel is hanging off of the truck helping the people step down. Miguel is from Ecuador and he is in the process of learning English so he can join Intake in Louisiana this year. 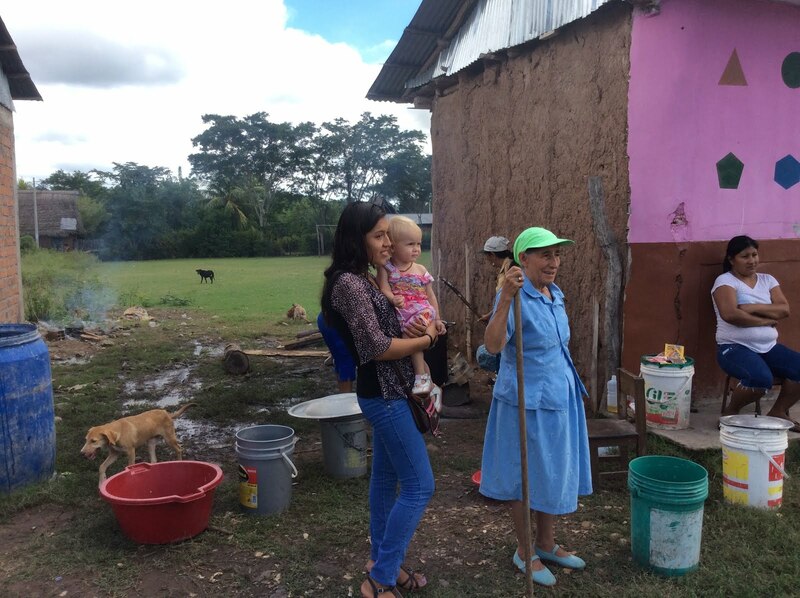 He lived in the community where FMC had missionaries and heard God asking him to enter the mission. Miguel in turn has helped one of our Peruvian friends hear the call from the Lord and this young man is discerning missions as well. School was put on hold for mass. All of the chidden with the teachers joined us for mass that day. It was so beautiful to see the children there with us. For most it was their first time at mass. The children sat in the aisle and Bishop Rafael directed part of his homily to them. It was so precious. 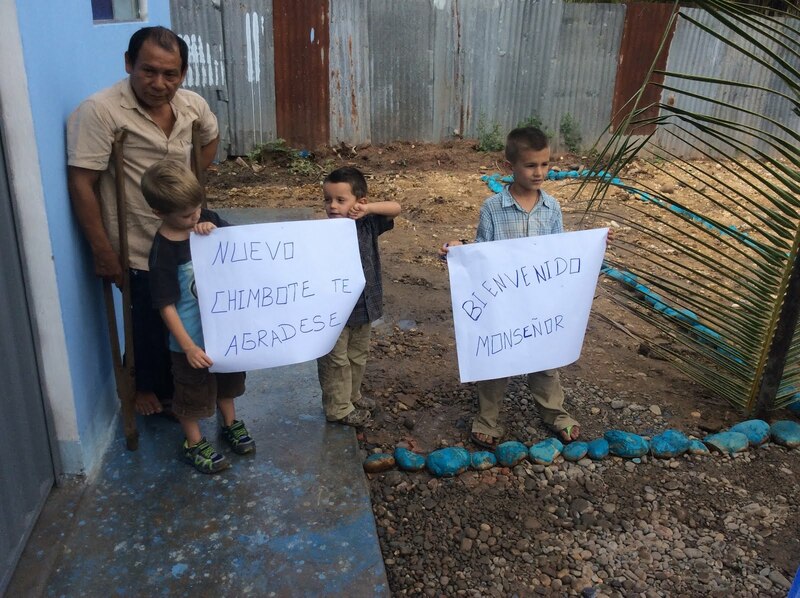 Our friend Max made these signs to welcome Bishop Rafael. The kids were so excited to hold the signs. At one point all you could see was the sign and some feet. Padre Paco, Bishop Rafael, and Padre Leopoldo (L-R). We have had the pleasure to sit and talk with Bishop Rafael. He is so humble and encouraging. When we stayed in the retreat center in Moyobamba he was the one who opened the doors and he was the one who made our beds up. Padre Paco and Padre Leopoldo are missionary priests from Córdoba, Spain. I can not express my gratitude for serving under these amazing holy men. God has truly blessed us! You can see part of Dante in the background. Dante is a man from Picota that is currently in the seminary. He will be ordained as a priest in two years. Blessing of the statue of the Divine Mercy. Bishop Rafael giving his homily. He talked about the importance of receiving baptism but also of changing your life and living for Jesus. It was very beautiful! This was something that we had been sharing with the people. It was very good for them to hear it from Bishop Rafael. Taylor was asked to share about our experience in finding the community of Nuevo Chimbote. He also shared in our joy of journeying with them over the past year. We have been so blessed to witness the love that they have for Jesus blossom and grow. Our friend Lider. When we first came to Nuevo Chimbote he wanted to have his children receive baptism. When the faith community started to come alive we asked him to become the church leader for the community. He reluctantly accepted. It wasn't until after this mass that he shared his testimony with us. His testimony brought me to tears. (This is why we sold everything. This is why we are missionaries.) Before we came to town he said that he drank. I am assuming that it was like most men here which means he drank a lot. When we came to town and started classes he didn't have a relationship with Jesus. As he attended the studies with us and as he read the bible we gave him it was then that he found Jesus. He found Jesus and he changed his life. He stopped drinking and started reading his bible. He sought the Lord and started living for the Lord as well. He is an amazing encouragement for the people of Nuevo Chimbote. He often begs for patience for the community as they are still coming to know the faith. He also is so open to the Holy Spirit. He is a shy man but when he feels the Holy Spirit he has no problem speaking up and sharing. It is so beautiful to see this. I think the most beautiful thing he shared was that he has fallen back into old ways every once in a while but he then turns to Jesus and begs for His mercy. Lider and his wife Dolly will be receiving the sacrament of marriage on September 23. They will also be receiving first confession, first communion, and confirmation that day as well. Their witness is far greater than anything I could ever say. I am so honored and humbled to call them my friends. The community of Nuevo Chimbote fed all of us after mass. Feeding 150+ people is a lot of work and you need to call in the troops. 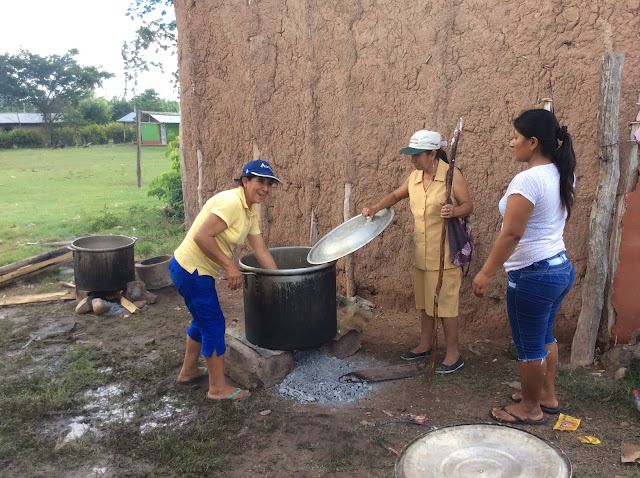 Some of our friends from Nuevo Egipto came to help cook so the ladies from Nuevo Chimbote could participate in their first mass in the chapel. There are not many people that Faustina will go to but Max's sister is one of them. Check out the size of those pots. You bring out the big guns when there are 150+ people. Preparing to cook the rice and beef for lunch. Another view of the large pot. When I saw this pot I instantly thought chicken boyah. It wasn't as large as the kettles we use in WI but it was big. I also then wanted chicken boyah and unfortunately that is not a dish they have here. The people in Nuevo Chimbote use the water from the canal for everything. They bath in the canal and wash their clothes in the canal. Each family has a certain time and day to go down to the canal to bath and wash. If you don't go down in your designated time you have to wait until next time. When the group was here working in the church the team had to go down to the canal and bucket water into a tank so they could have water to make concrete. The people also use this water to cook most of their food. 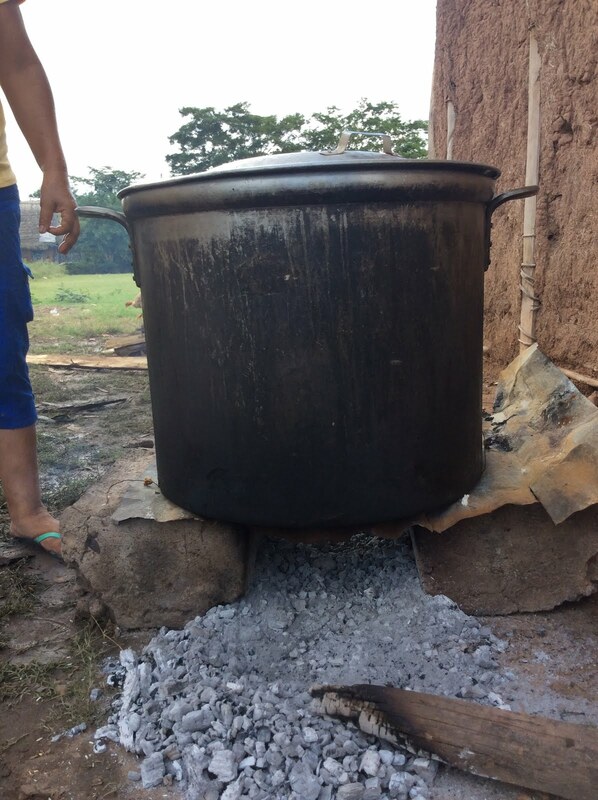 They use wood fires to get the water extremely hot to sanitize it before adding the ingredients. The fisher families in town can purchase good drinking water but most do not. Yuca is a wonderful starch that we were introduced to. It is delicious. We are often served boiled yuca with meat and rice. Our favorite way to prepare it though is fried. It is yummy like french fries. 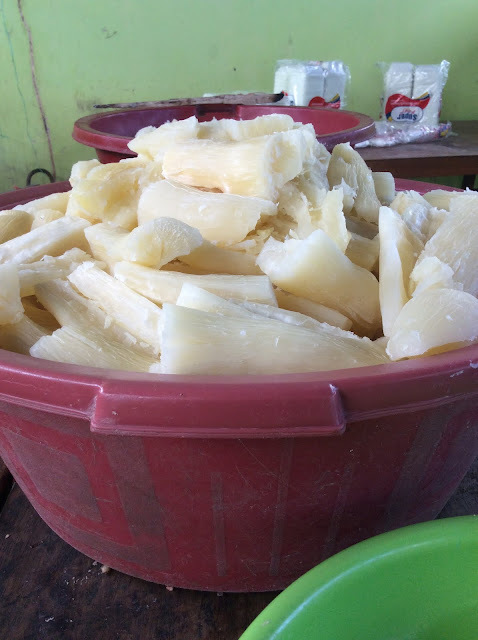 The flesh of the yuca is white which means that it takes on the color of whatever it is cooked with. This yuca was not cooked in the canal water. 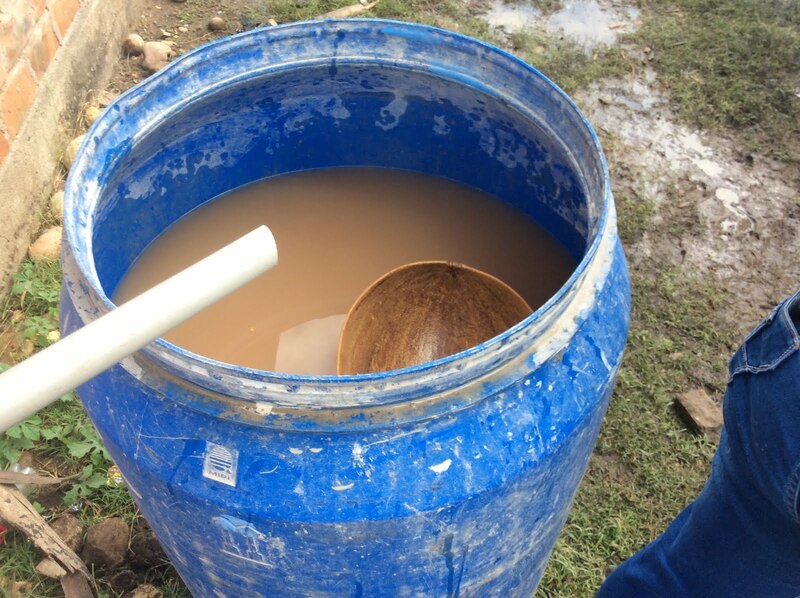 Our friend Hilda caught rainwater in buckets that week so we could have fresh clear water to boil the yuca in. It is said that you can tell the level of poverty of the people by the color of the yuca. If you are served white yuca the people either collect rainwater or good drinking water to cook it in. If it is darkly colored or is served with a sauce the people do not have access to clean water. Just four months ago an old dirt building came down and now this beautiful chapel stands in its place. The community celebrates a Liturgy of the Word service here every Sunday. Our family comes every Tuesday for a bible study. The faith is alive and growing. In September we will have a sacrament mass where Lider and Dolly will be married as well as many children will receive baptism and first communion. We want to send a special thanks to everyone who helped make this chapel possible. Thank you Holy Family parishioners for your prayers and support. Thank you to our friends and family in Brillion, Reedsville, Greenleaf, Appleton, Green Bay, Hilbert, Denmark, and Chilton. Heidi and John, Nancy and Mark, Curt, Christel, Jesse, Tom, Ken, and Mary Beth thank you for all of the blood, sweat, and tears that you put into this project! You touched the community in ways they were not expecting. It was so beautiful to watch the men of the community join you in the work. Your example helped bring Ulysses back to the faith. It was because of you that we were introduced to Fiorela. Thank you so much and we can't wait until we see you next year!! !